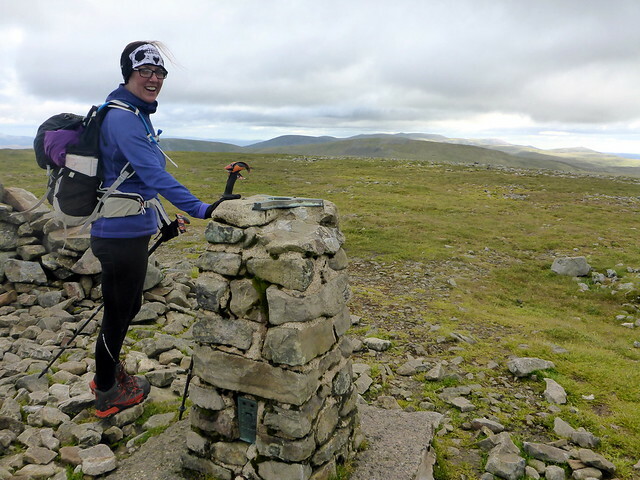 On the quest of Allison's Munro Tops, another visit to the Cairngorms was in order - the far flung tops of Ben Avon were to be brought into the fold. 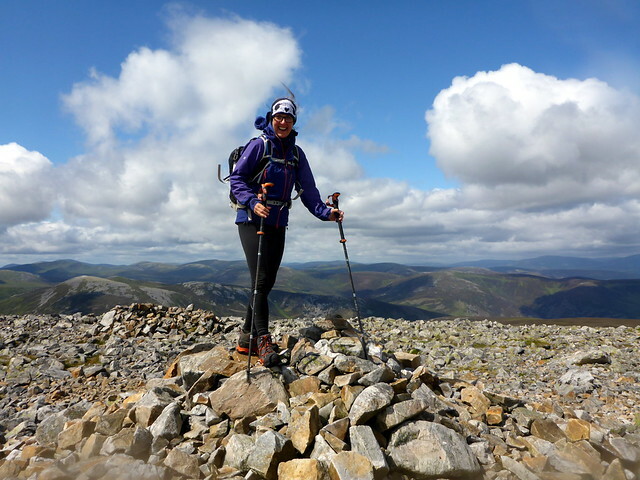 I did these as part of a 3 day Tops fest a couple of summers ago and remembered a very long trek out from the central summit of Ben Avon to the distant tops. 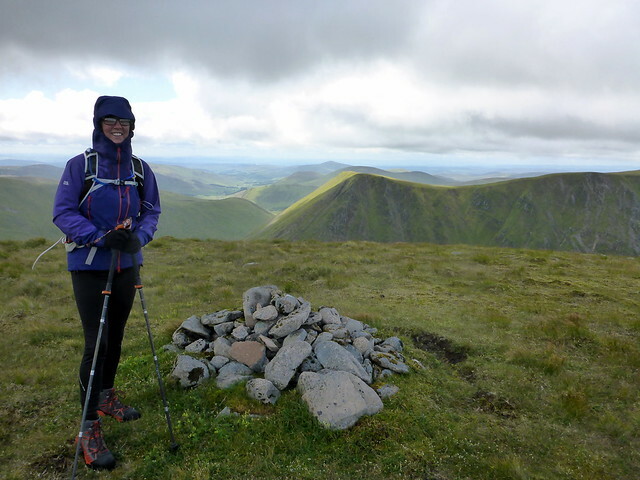 This weekend we were having a more sedate trip, just Beinn a'Bhuird and Ben Avon but with a couple of Simms on the way added for good measure. 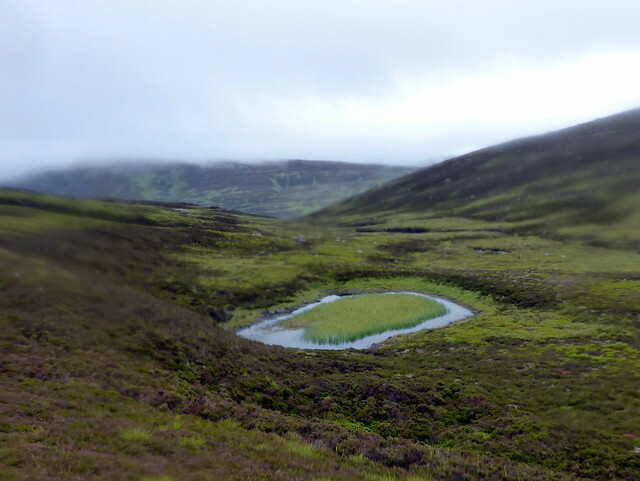 Drove up to Linn of Quoich on Thursday after work - i noted that the car parking area had been increased a bit and a £3 per day parking meter installed. I have no gripe with parking charges if the money goes back into the landscape as the noticeboard suggested. We gathered our gear and set off to walk a few kilometres in before setting up tent. 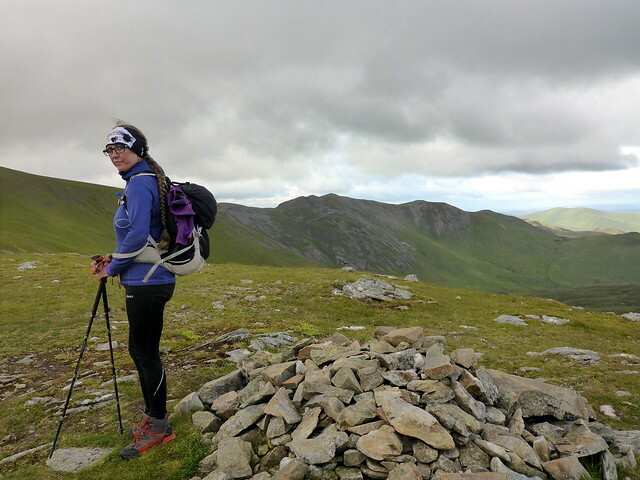 We'd previously used this approach to climb the two Munros so I remembered there was a flat area about 7km in which would suffice for camping tonight. 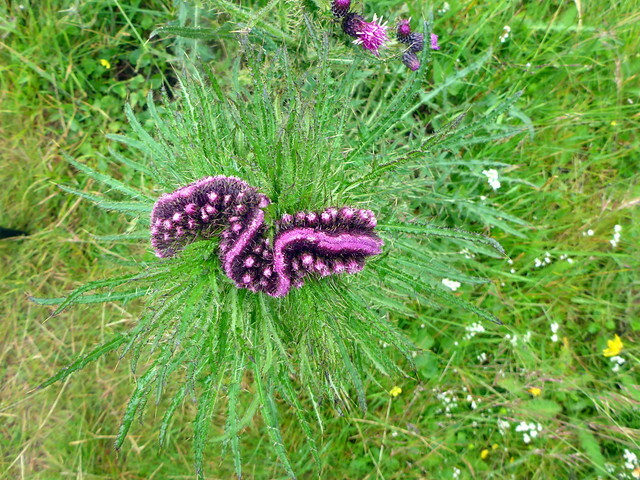 The clag was down on the hilltops but there was a brisk enough breeze to keep the winged fiends away. 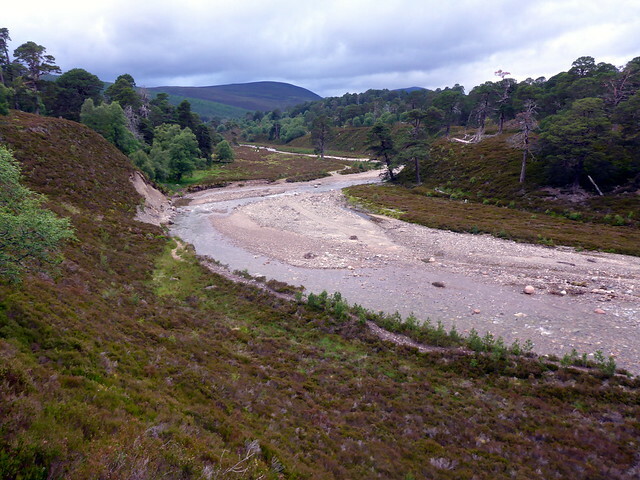 The track wends down to the Quoich Water but was significantly damaged by Storm Frank in Dec 15 - a section of track remains washed away, resulting in a diversion up the hillside and evidence of damage persists through the glen. 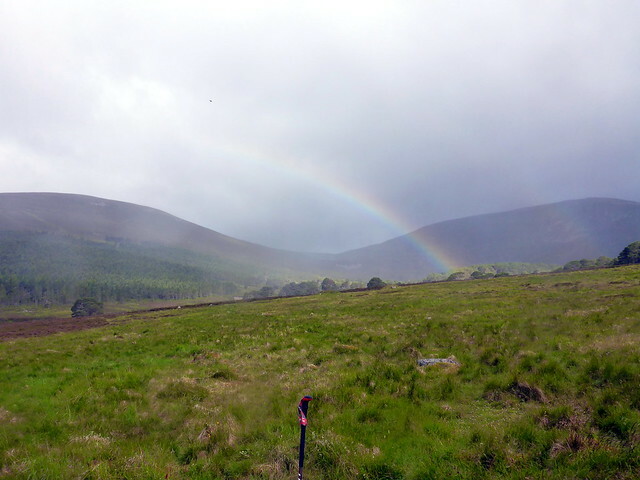 After about an hour the rain started and we set off to look for an alternate place to camp - thinking some flat looking land by the river would do. 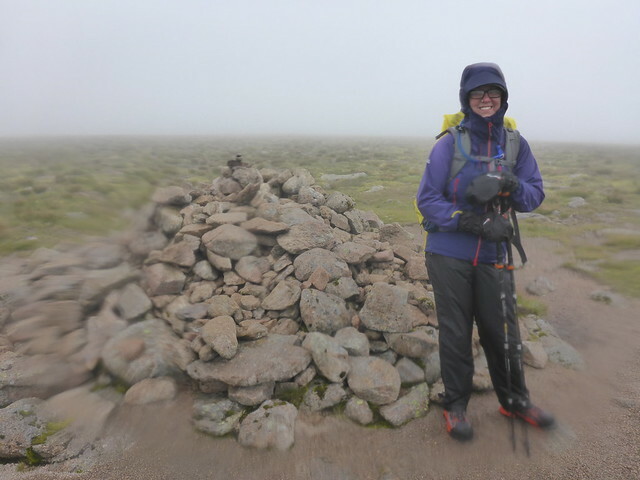 However this was far too bumpy and wet and we ended up with wet boots/trousers from the wet grass and heather, whilst still having to walk on to our previously chosen site. Fortunately the rain didn't come to much and we were able to pitch relatively unscathed. 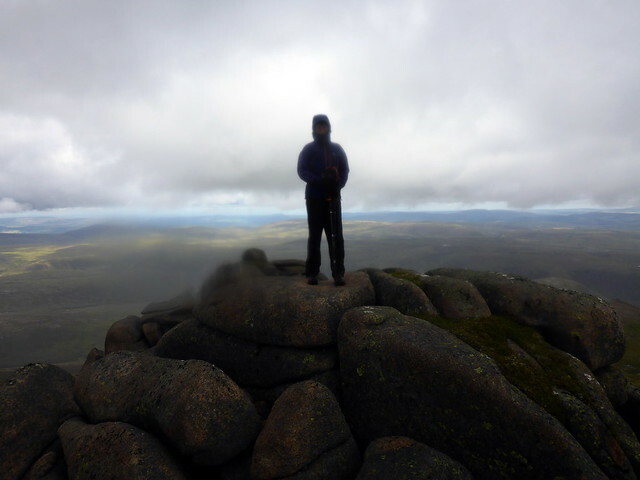 A quiet night and a claggy but dry morning greeted us. 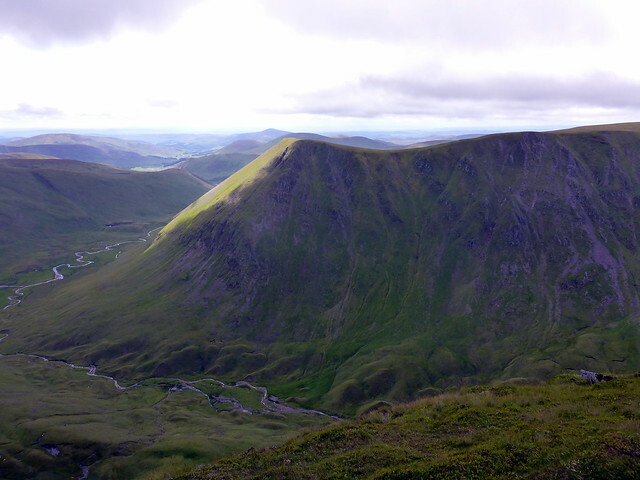 Today's plan was to climb Beinn a'Bhuird and its Tops and mosey over to Ben Avon, camping somewhere on the return. No particular rush. 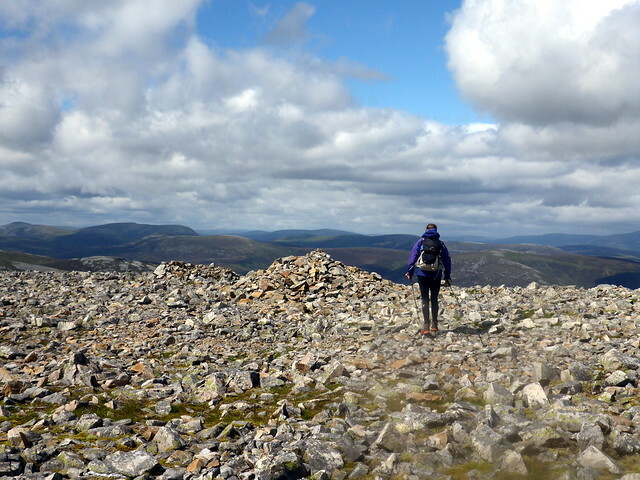 The path up Carn Allt na Beinne provides a wonderfully easy ascent - I hardly noticed the incline as we rose in measured steps to over 1100m. 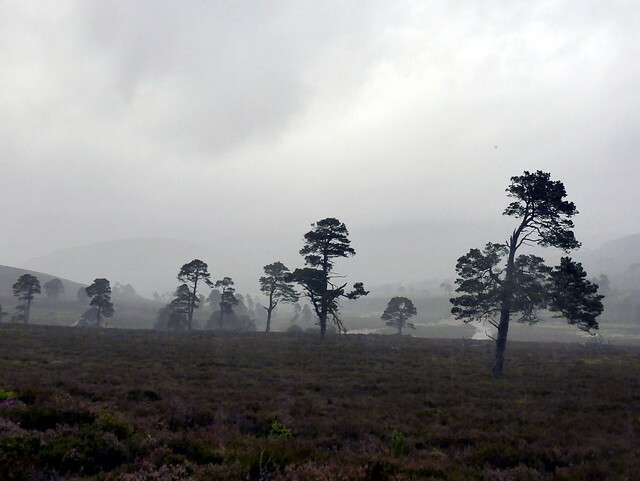 The clag thickened and the rain started - not the finest weather unfortunately. 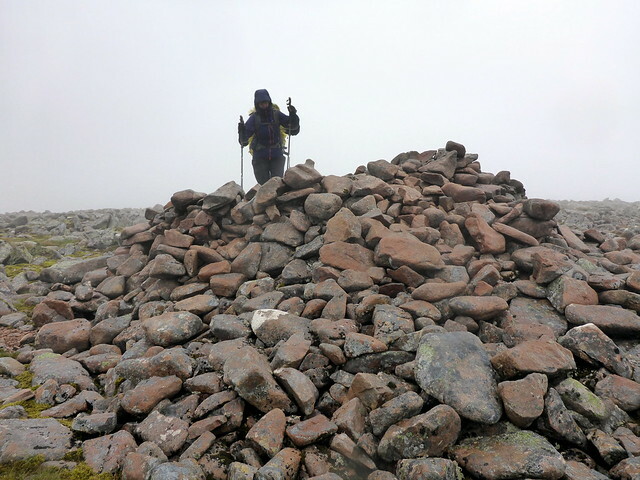 We searched around for the 1179m South Summit then headed over to the old Munro Top with the cairn at 1177m. 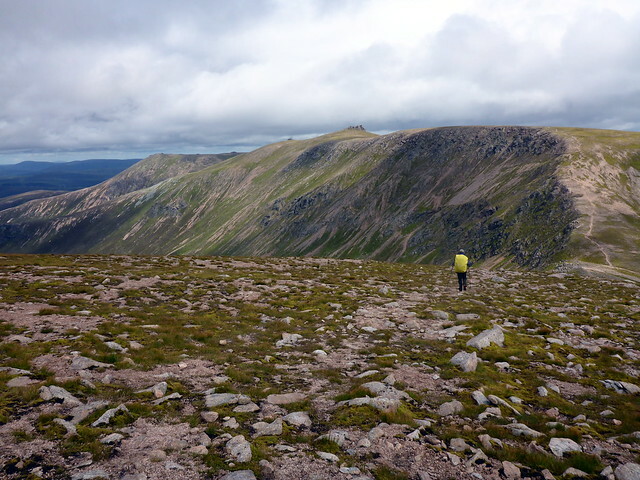 Returning along Bloodhound Buttress gave opportunity to look down into Coire an Dubh-lochain. 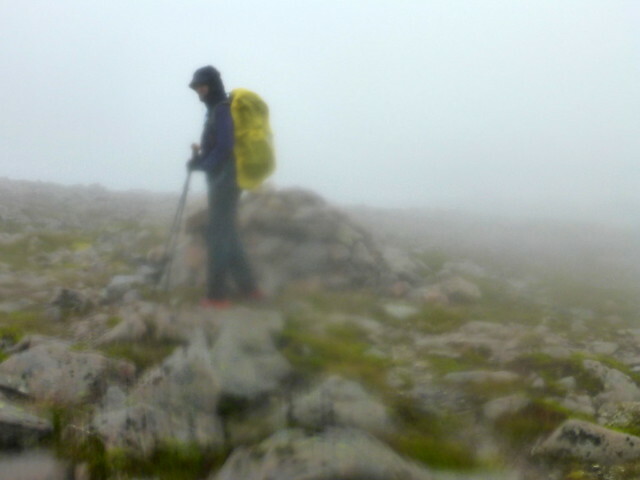 We met a solo walker heading from the North Top and looking kinda lost - we reassured him he was on track for the South Top. 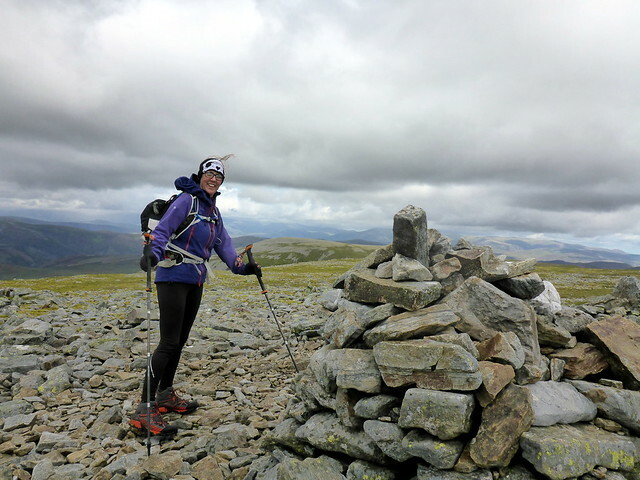 Attaining the Munro Summit we set off for the crest of Stob an t-Sluichd which loomed intermittently out of the clag. 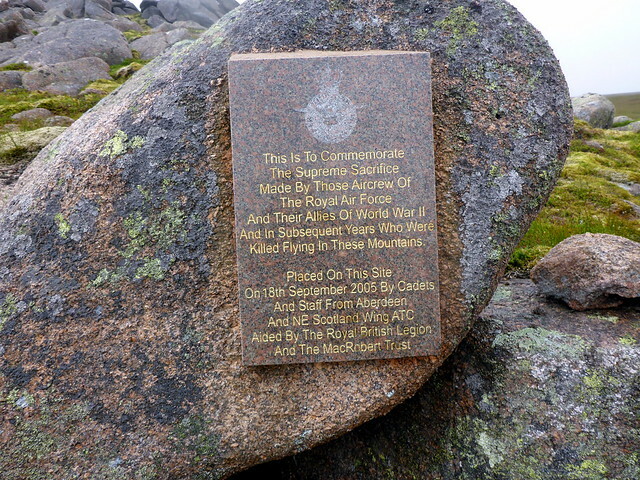 I remembered the aircraft wreckage ("Ox-Box" from 1945) and we found it, along with a plaque I hadn't noticed first time around. 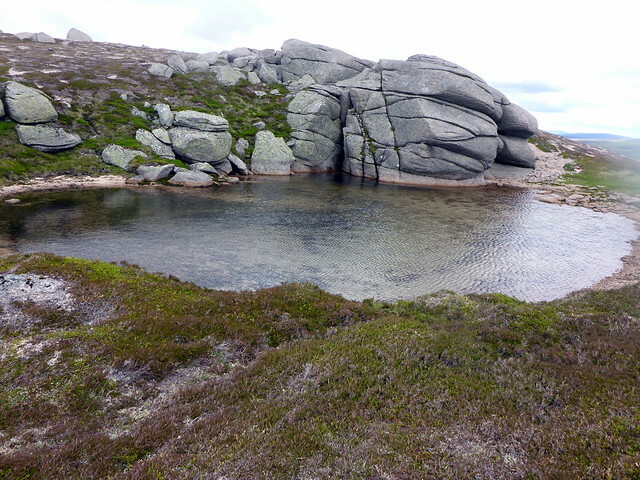 We scrambled over the granite spine to reach the summit and returned to the start of the crest to have lunch. 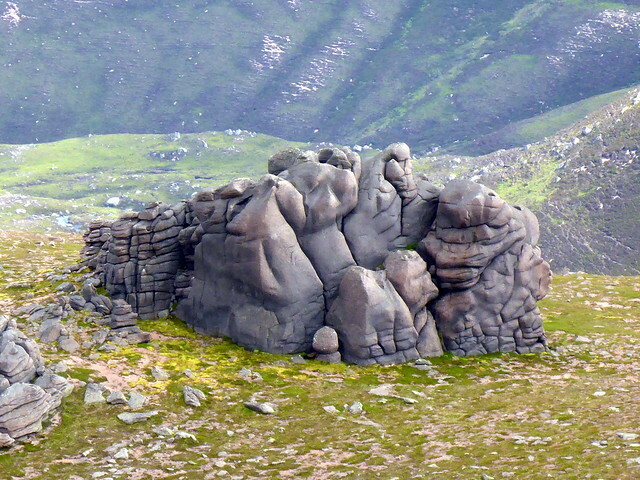 I love these tors - we spotted one lower down on the ridge that Allison thought looked like a Moomin family gathering. 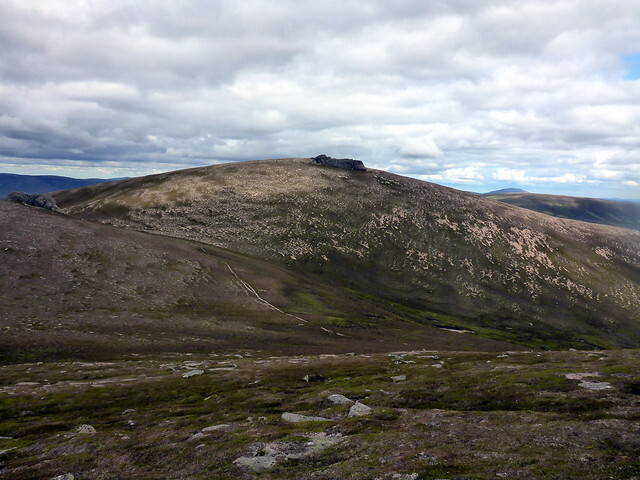 Wispy cloud covered then revealed the summit of Ben Avon - we set off over Cnap a'Chleirich and down to The Sneck, spotting a number of other walkers coming up from the South. 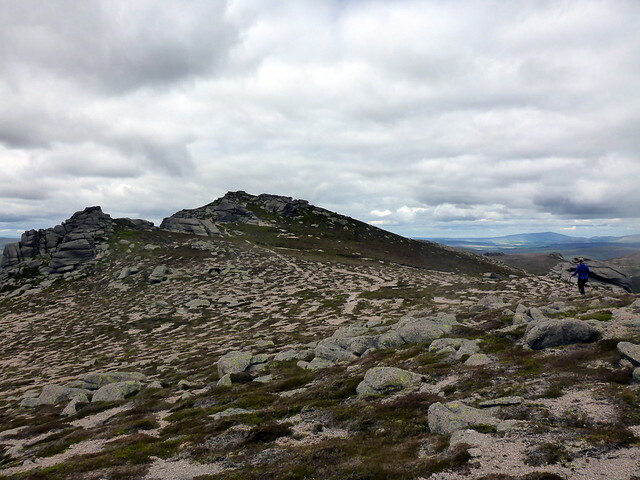 A brisk pull up to Avon, a wee scramble on the summit Tor and it was time to set off for the northern Tops. 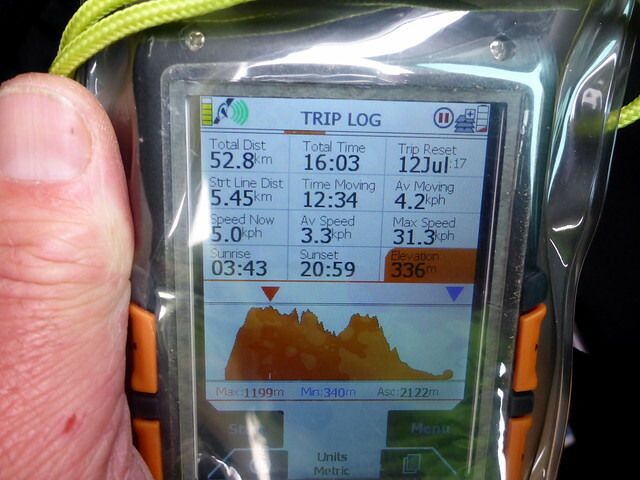 From the tor at it's summit we descended along a track and picked up our sacks where we'd left them at the stream. It was now after 5pm and time to stop. 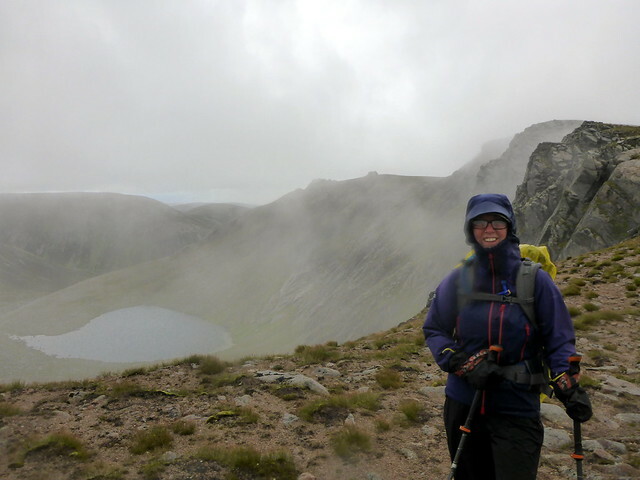 we found some nice dry ground with short alpine vegetation and set up camp in the sight of Dark Lochnagar, the pointed peak of Meikle Pap jutting jauntily upwards. 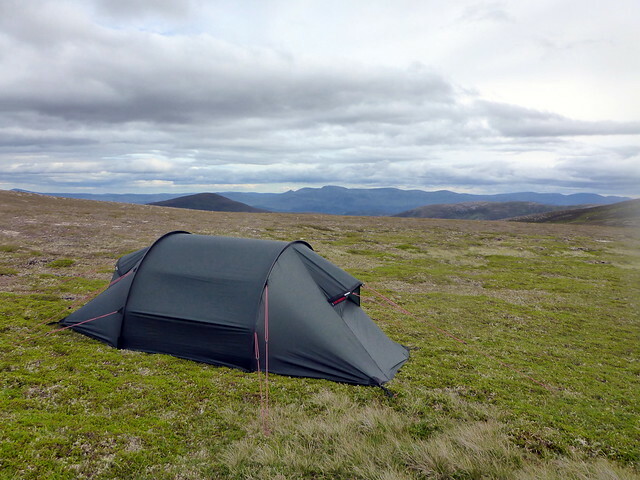 A couple of hours later the wind switched direction by 90 degrees, hitting the tent broadside. Although the Hille performed flawlessly it did mean we had a noisier night than envisaged and not much sleep was had. 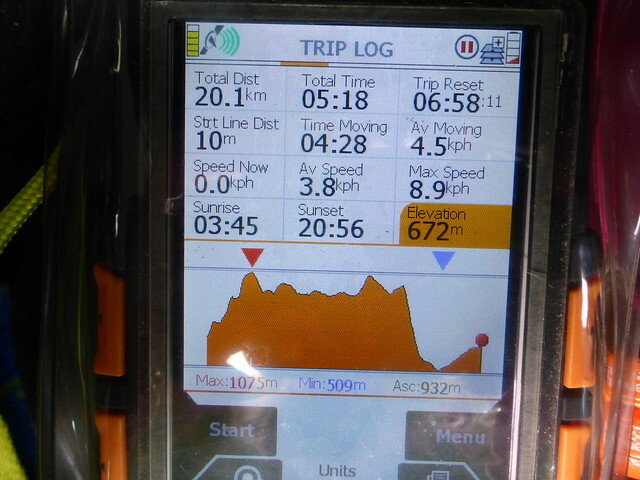 Despite the wind it was still quite warm 9for 950m elevation) and a middle of the night nip out to answer the call of nature wasn't chilling. 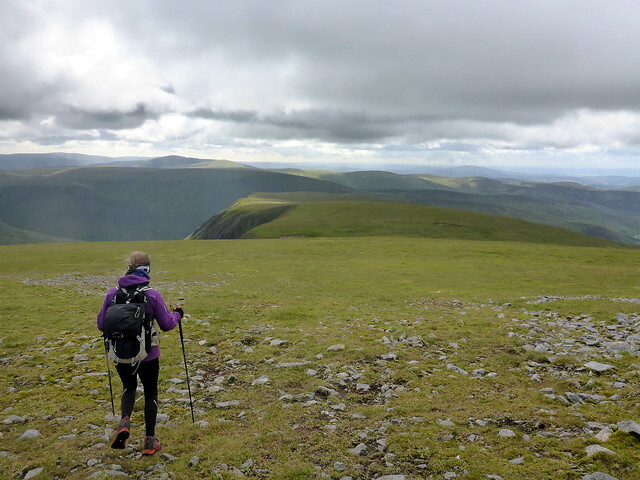 Reaching Carn an Eas we descend steeply SE to the final Munro Top of Creag an Dail Mhor. 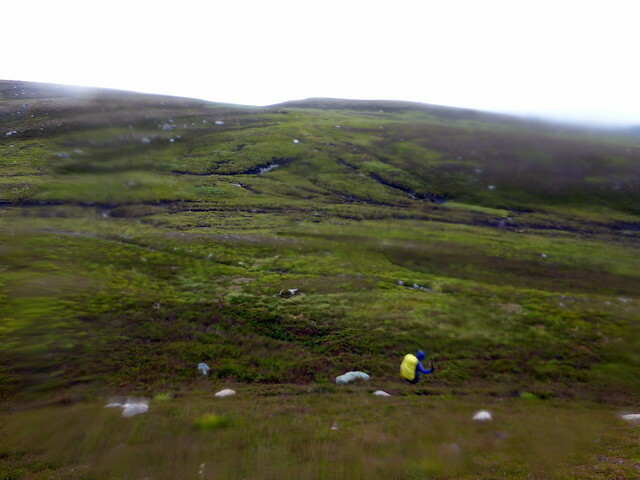 Then it's off to the SW over rough boulderfields - i manage to go off in the wrong direction in the clag until the GPS corrects me. 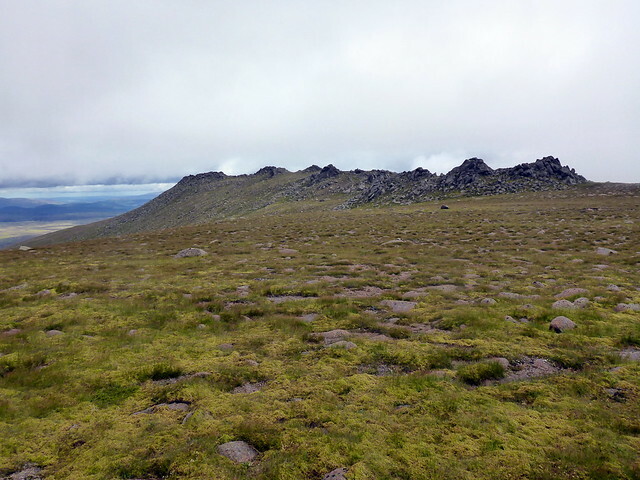 We go over Carn Eag Dhubh then down towards the track. 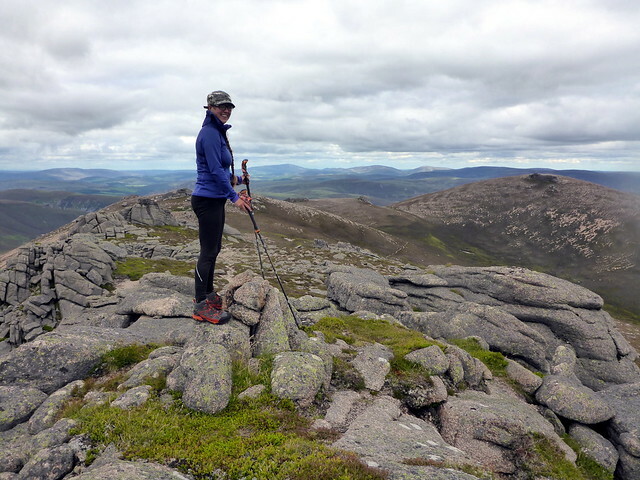 Our last objective is Meall an t-Slugain - we stop for lunch before climbing this, the larger outline of the Corbett Carn na Drochaide looming behind. 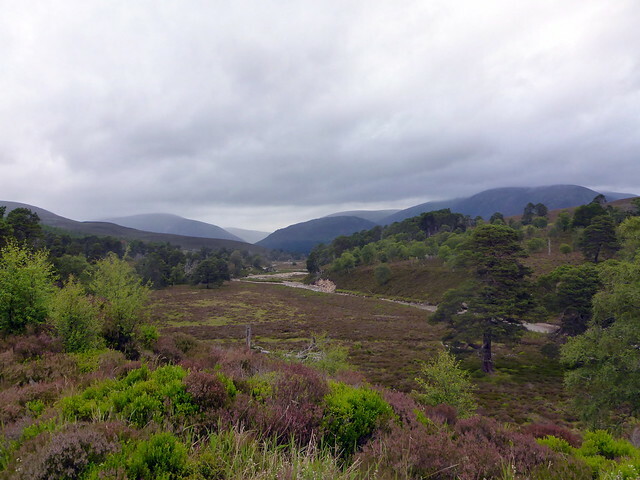 I suggest to Allison we could include this as well, to a withering look It's down towards the Quoich Water and a walk through the lovely old forest, this path too bearing the signs of Storm Frank's vengeance. Back at the car it's a busy parking area including an immense German mobile home that looks like it would survive Armageddon. 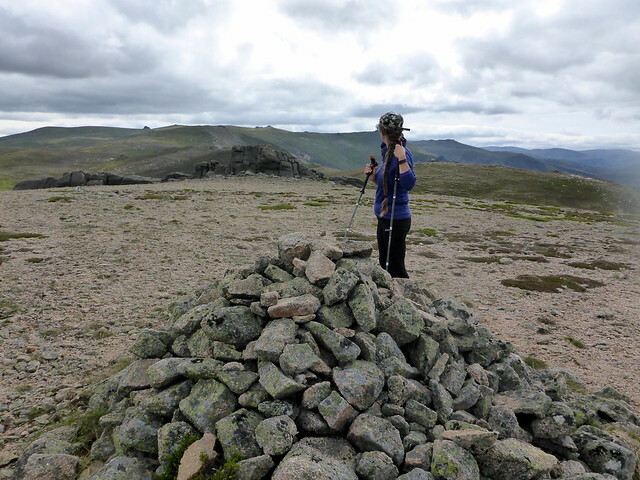 We've decided to do the Tops around Glas Maol tomorrow so a return Braemar way is undertaken. I'm not optimistic about getting a space at the campsite, as it was full up a couple weekends ago when we visited, but we are in luck, there's one space left. A nice shower and tasty meal - the evening spoiled only by the rain coming on when it would have been nicer to sit outside over a whisky. Sunday morning - we're up early in the sunshine. 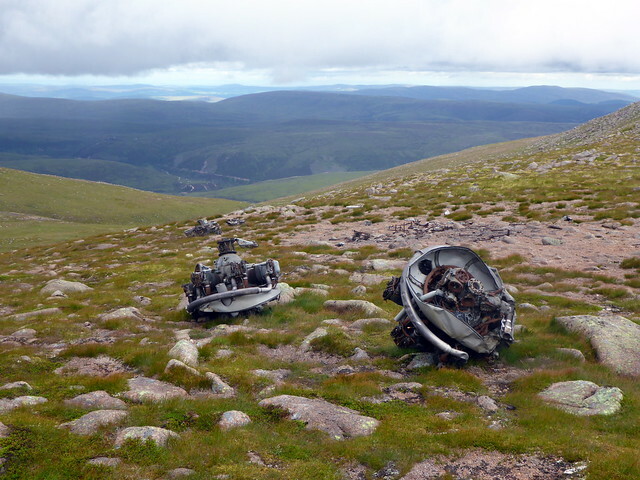 Drive to Glenshee and park by the ski lifts. 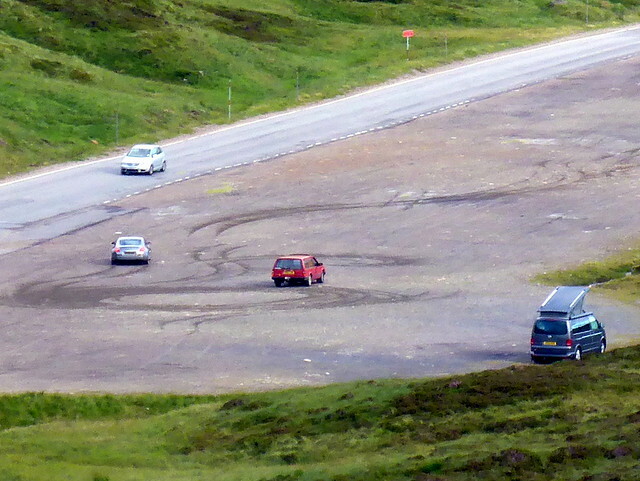 There's a couple of boy racers skidding around the gravel parking areas - one in an old Volvo estate - hardly the typical machine for this kind of foolery. It's 8.15am on a Sunday morning - weird. 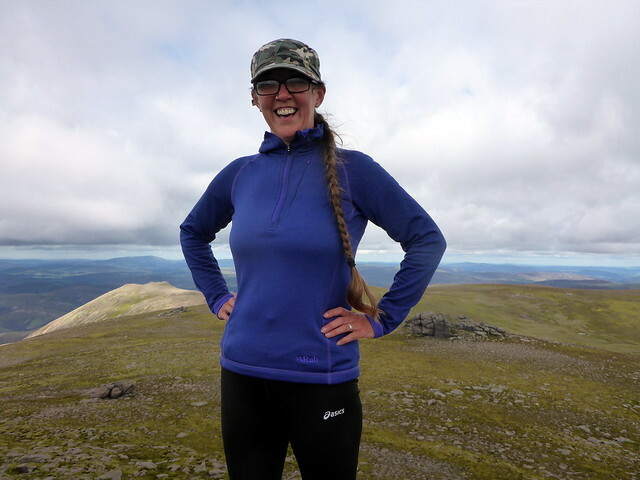 We set off up the track to Meall Odhar - starting at a ridiculous 676m elevation, it doesn't take very long to get to the summit. Despite the rays of sunshine there is a biting wind. 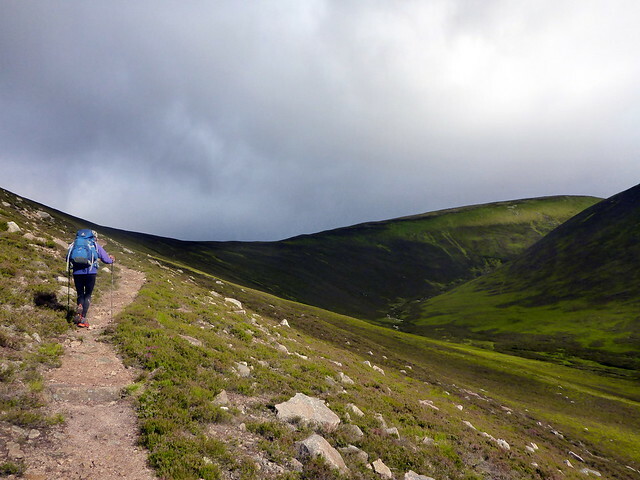 On up to Glas Maol, where we meet a few folk, indeed the hills here are very busy today. 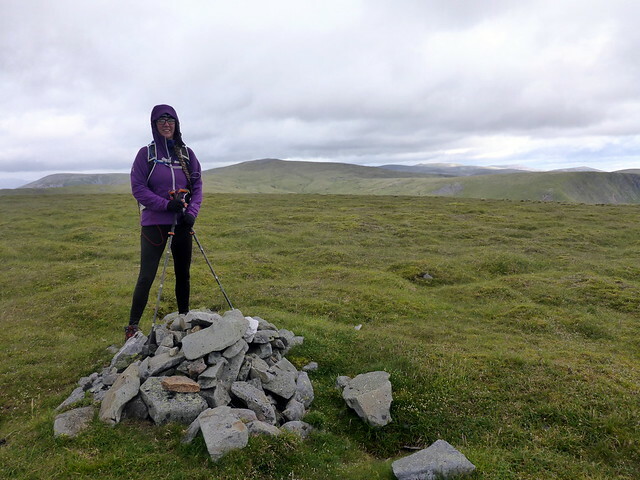 Down SE to the second Top of Little Glas Maol then the long haul out to Druim Mor, almost 5km although most of it on track and not much difference in elevation. 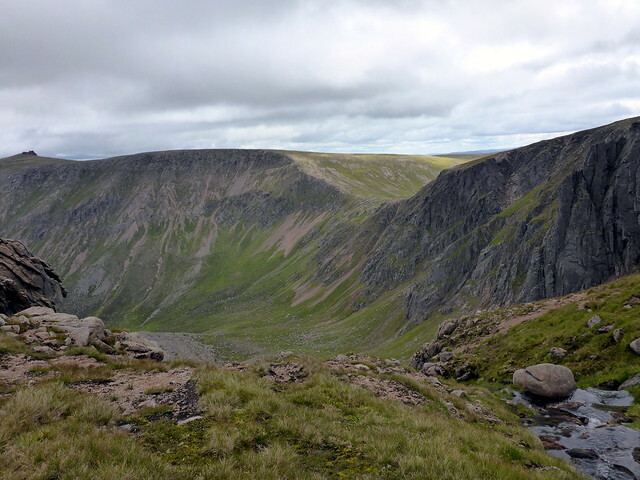 The cliffs of Glas Maol are impressive from here as they plunge down into Caenlochan Glen. 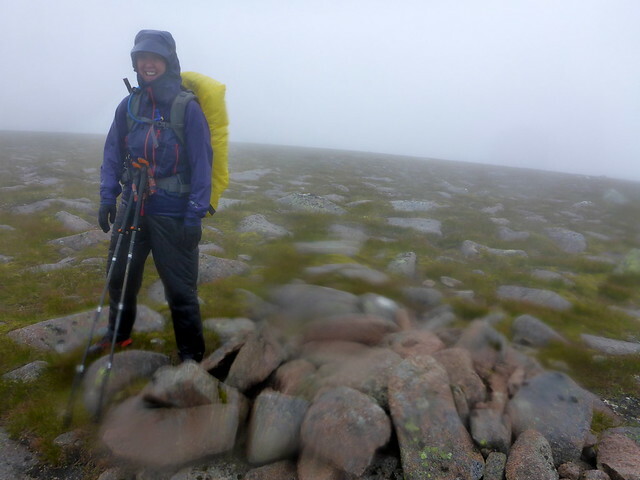 I have to be back home early enough to go out for dinner tonight, so we wonder if there's enough time to include a couple of Munros - it's now brightening up and seems silly not to. 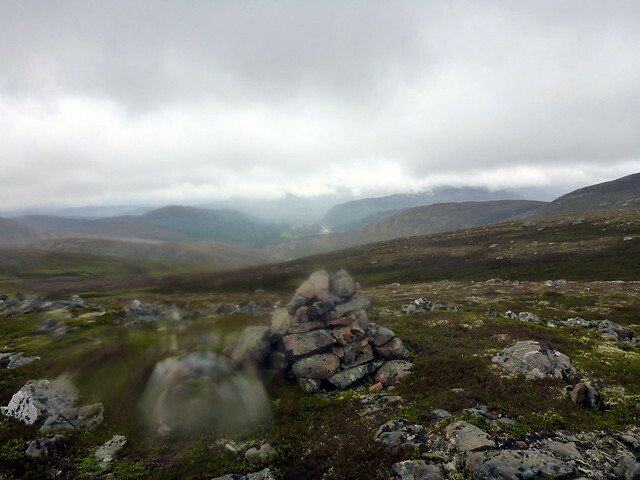 We head up to Cairn a'Claise then on to Carn an Tuirc. 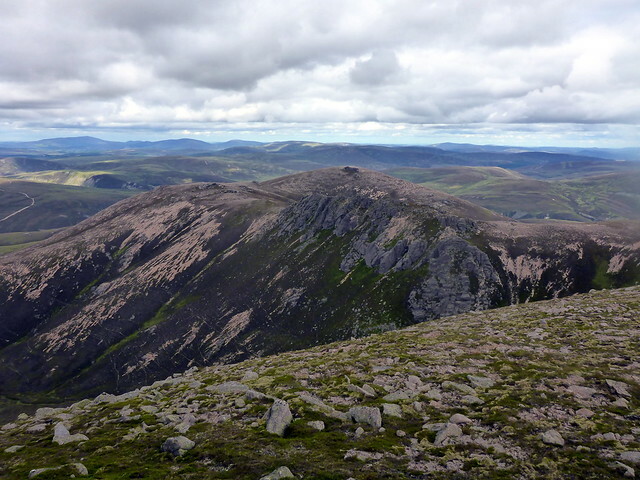 There's a Simm (Carn Dubh) down the NW from Tuirc, but i reckon (wisely) this would be a hill too far and we descend along the track back to the road, then the 150m or so pull up to where the car is parked. The Ski Centre is very busy today despite the absence of snow, the ski lift up to Cairnwell is running. Ah well, another 8 Tops bagged for Allison, she's getting there. Last edited by weaselmaster on Tue Jul 18, 2017 8:38 pm, edited 1 time in total. Well done you two Love the photo of the "moomins"